Even superheroes sometimes run into logistical problems. In fact, there are certain types of practical issues you’d have to be a superhero to even have to worry about. Case in point: When you change into your superhero costume, what do you do with your civilian outfit? Do you carry it with you? No, too inconvenient. But, what if you need to change back into your suit and don’t have it with you? 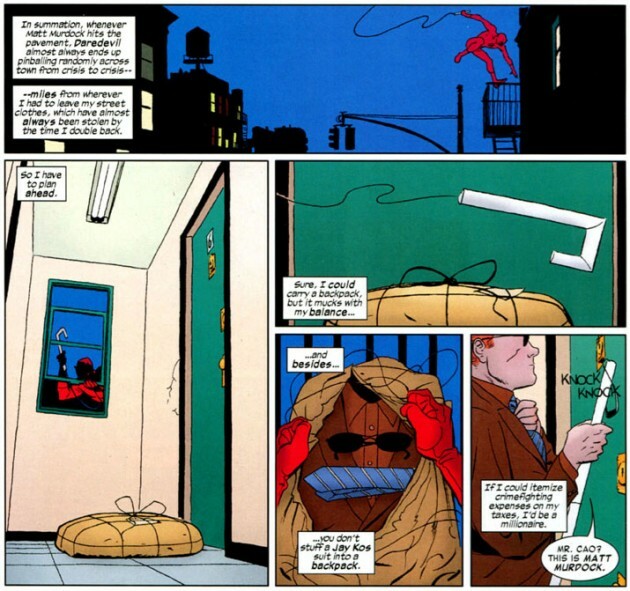 It took Matt Murdock forty-seven years and over five hundred issues, but he finally seems to have found a solution to this problem, as seen below in Daredevil #4 by Mark Waid and Marcos Martín. You know what? This makes much more sense than the previous times, Matt has tried to solve this problem (see below). Apparently, you start off by having an extra suit delivered to your destination. 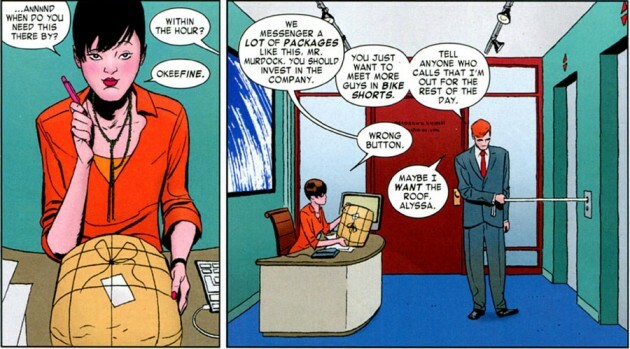 A secretary (and here we have our very first look at new Nelson & Murdock receptionist Alyssa) and access to a messenger service are strictly required. Well, the messenger service more so than the secretary. Once you reach your destination, all you have to do is unwrap the package (hopefully the person who lives at the delivery address won’t get to it first) and put your perfectly pressed suit on. Perfect! Looking back at comic book history, we know that this solution came about after quite a bit of trial and error on Matt’s part. The first time Matt felt that the suit situation was holding him back was in Daredevil #3 (1964) as told in a scene that one of the panels above is clearly paying homage to. At that time, Matt was apparently bouncing his civilian clothes around in a tight ball before he decided to make a little hood for it, though the hood was never seen again. Now all he needs to do messenger a shower and a Tommy Hilfiger bath kit. This was a fun sequence that takes a little poke at the logistical problems and all around absurdity of the superhero with a secret identity. The only problem with scenes like this is they also draw direct attention to the logistical problems and all around absurdity of the superhero with a secret identity. Now I know what to do if I ever become a blind lawyer/superhero.